Let's see. In the last episode of my waffle weave adventure (before my little detour after finding some of my blog posts stolen), I had figured out a way to both correct my waffle weave threading as well as widen it. The warp I added for width has been pretty successful, though not without some problems. What I have had trouble with has been a curving fell. 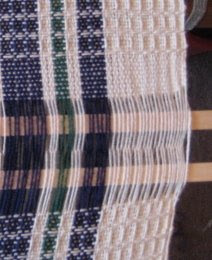 "Fell", for you non-weavers, is the leading edge of the cloth on the loom; the line of fabric made by the last weft thread. It needs to be perfectly straight, or the weft won't beat in properly. 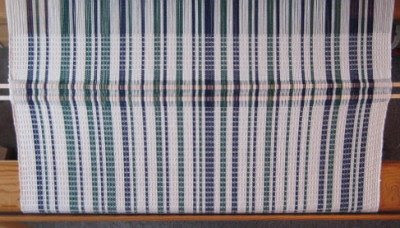 Sometimes it curves upward at the selvedges, so that your weaving looks like it's smiling at you. This is the case if the warp at the edges is too loose, or if the weft is pulled too hard through the shed so as to cause unnecessary draw-in. Initially, I assumed it had to do with the amount of water in my milk jug weights. 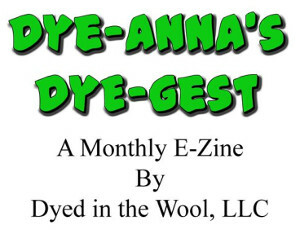 However, even after adjusting the amount of water and taking care with the weft didn't completely correct this problem. In analyzing the problem, I realized that the sticks I added to tie the extra warp to (photo here), are not supported by the front apron strings. I suspect that that may be the problem, because those sticks still flex somewhat under the weight of the warp tension. Here's a close-up, in which you can really see the problem with the fell. See the upward curve of the bottom cloth? As a beginning weaver I had this problem a lot. Oftentimes it was simply uneven tension in the warp, especially if I didn't wind it under an even tension for its entire length. The other problem I've had to learn to correct is excessive draw-in. This appears to be related to either the shuttle itself or how I throw it. For finer warp threads like the 10/2 I'm using, I use boat shuttles. My favorite (because it holds the most yarn) is my 13.5 inch Gilmore shuttle. It holds six inch bobbins, which are almost too snug a fit in the shuttle, though they still rotate freely. With all my boat shuttles, I find that I must take care with the amount of weft pulled from the bobbin before I throw the shuttle. If enough isn't pulled out, there is a tendency for the selvedges to pull in too much. All this means that I need to pay attention to what I'm doing, which is probably a good thing anyway. However, even taking care to correct these two things, I was still having the problem. So far, my added sticks seem to be working, and I don't have anymore curves to deal with. Hopefully that will remain to be the case! I'll let you know how well it actually works. I've been allowed to weave 10 minutes twice a day and have been working my waffle weave. I've also noticed I need to pay close attention to the selvages on these towels. Every project has its challenges. Yikes - I have a hard enough time paying attention to the twist on my spinning - weaving looks way to complicated for me! :-) T.
I really have a hard time with the smile and also have discovered that I am most successful when I pull some weft from the bobbin before I throw it, not that I actually know what I'm doing from project to project. I am learning however and just about to get a warp tied on and weave - finally. Dressing a loom in minutes a day at 24 epi doesn't go very far. It's supposed to be Ms and Os - now I have to figure out how to treddle it. Barb, it's sounds as though you are on the road to recovery. That's good news! Sharon,I think a lot of us have problems with this. I've had less problems with those "smiles" since I got my Glimakra, but if I don't take care, I can still get them. I never stop learning from your blog. Thanks!